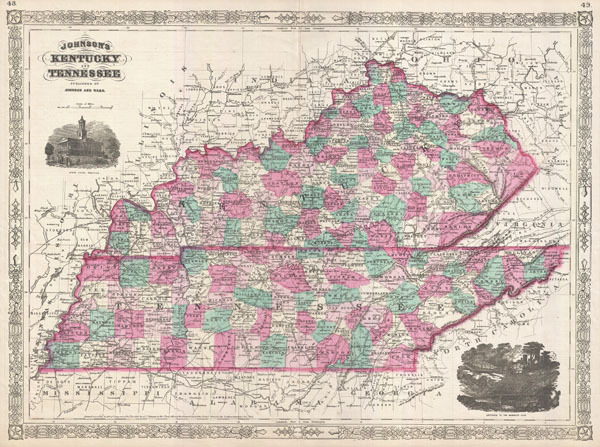 A beautiful example of A. J. Johnson's 1866 map of Kentucky and Tennessee. Represents Johnson's third iteration of this map, which he updated in 1865 to reflect changes to these secessionist states following the American Civil War. Map shows both states in full with color coding according to county. Inset views of the Nashville State House and the Entrance to Mammoth Cave decorate the map in the upper left and lower right quadrants, respectively. Features the fretwork style border common to Johnson's atlas work from 1863 to 1869. Published by A. J. Johnson and Ward as page numbers 48-49 in the 1866 edition of Johnson's New Illustrated Family Atlas. This is the last edition of the Johnson Atlas to bear the 'Johnson and Ward' imprint. Very good condition. Original centerfold. Text on verso. Rumsey 2905.022 (1860 edition). Phillips (Atlases) 6140-30.